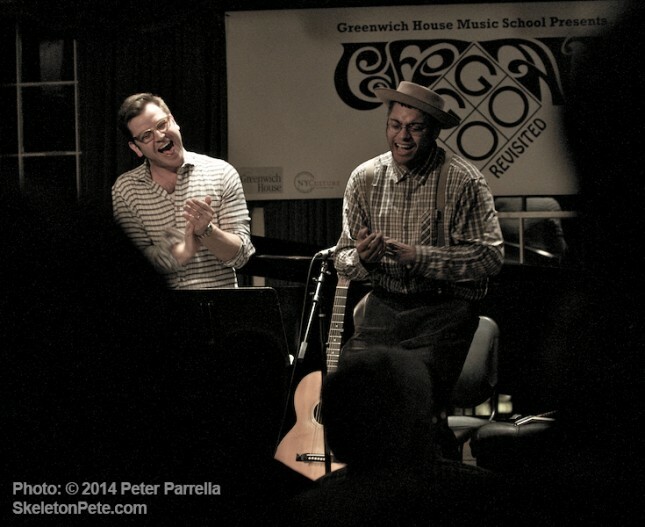 Eli Reed and Dom Flemons Shake ’em on Down at Greenwich House Café au Go Go Revisited. Greenwich House Music School rolled out the carpet for a post Mardi Gras jamboree that had attendees clapping and testifying like an old time revival meeting. The show was the second in a two month long homage to the influential 1960’s Greenwich Village club The Café au Go Go. Instead of a full second line parade the instigators of this roof raising evening were two conservators of American roots music Dom Flemons and Eli “Paperboy” Reed. Along with their talents for performing in a variety of styles and on a variety of instruments, the two share a collector’s affection for the obscure gems discovered in dusty stacks of record crates. These root cellar relics ultimately inform their aesthetic as well as their repertoire. Although performing as a duo for the first time, the two had an “old soul” symbiosis, choosing tunes that suited them both extremely well. The performances were loose and joyful, clearly a labor of love. Over the course of the evening they juggled instruments from guitars and banjo to piano. There were dueling harmonicas (“harps” to bluesmen) featured on “Polly Put the Kettle On” and Dom pulled out the “peculiar” castanet-like “bones,” panpipe styled “quill,” and coaxed bass notes from an old cider jug to augment the sound. The set ended with “Do Lord Remember Me,” an a capella call and response that brought the audience to their feet to clap and sing along. Eli “Paperboy” Reed Proclaims the Blues Gospel. “Paperboy” is preparing for the release of a new album of original material and a European tour to support it. Check his official website for dates and details. When not promoting his own music he has been a regular fixture at Brooklyn’s Dig Deeper events. Along with unearthing the best Northern Soul dance tunes, the Dig Deeper promoters have routinely brought the artists who recorded them to the stage, often for the first time in decades. After the much lamented closing of Park Slope’s Southpaw club, the events have found a solid following at Littlefield on Degraw Street below Fourth Avenue. Dom Flemons Pickin’ Some Papa Charlie Jackson. Dom Flemons, formerly of The Carolina Chocolate Drops and currently on solo tour through August, will be back in NYC in April for the Brooklyn Folk Festival at The Bell House. 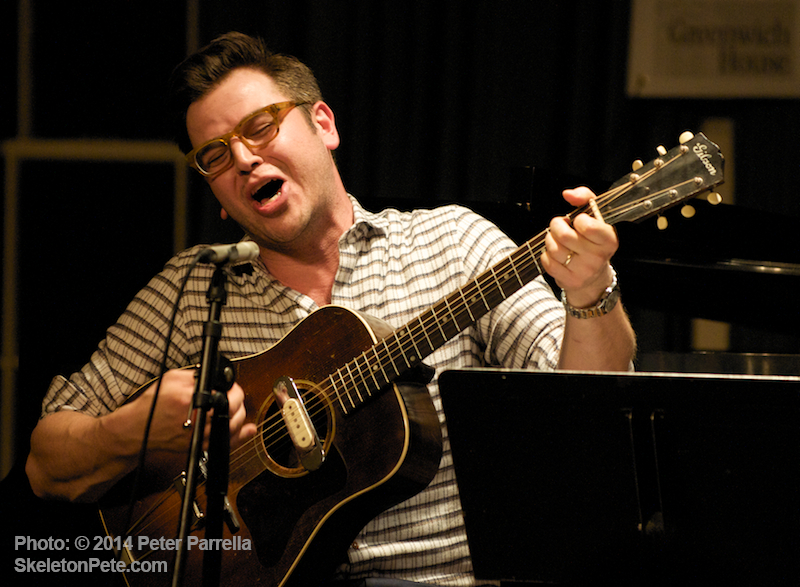 Although not in his arsenal of instruments that night Flemons related purchasing a large 6 string banjo at Brooklyn’s RetroFret guitar shop, similar to the one played by Papa Charlie Jackson (author of “Salty Dog” and “Spoonful Blues”) whose “Baby Please Loan Me Your Heart” the duo included in the set. 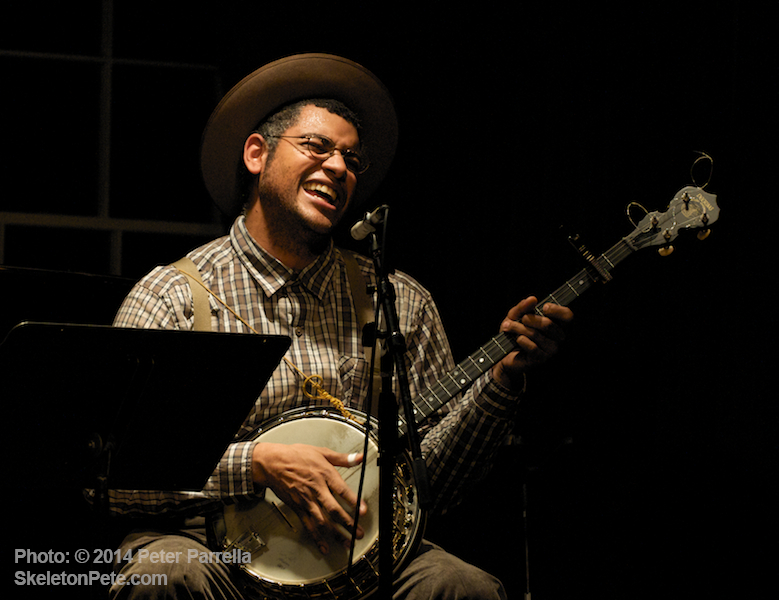 Flemons’ current album is American Songster. It’s loose field-recorded vibe and detailed annotation is about as close to a modern day Folkways record as you’re likely to find. It’s available on the Music Maker Series label, as are the current recordings of other Chocolate Drops cohorts, Rhiannon Giddens and Leyla McCalla. The Music Maker Relief Foundation is a non-profit organization dedicated to helping the “true pioneers and forgotten heroes of Southern music traditions.” See their website for what you can do to help. In retrospect the event served not only as a wonderful night of music and unique pairing of two kindred souls but as a primer on the cross pollination of blues, folk, country, soul and balladry. Kind of like a live version of Barney Hoskyns’ book Say It One Time for the Broken Hearted. I hope Dom and Eli can find the right time in their schedules to do this again soon. The Café au Go Go Revisited Series, conceived by Greenwich House Music School Director Rachel Black and compiled/curated by Jennie Wasserman, continues on Thursdays through April 24, 2014. Check the website for upcoming artists and ticket purchase information.